The African Students Association (ASA) was established on 17 December 1961 in Durban under the auspices of the banned African National Congress (ANC). At the time of its formation, Durban was the centre of Black student life in the country. The association’s membership was open to both secondary and higher education students, but membership was only open to Africans. Thabo Mbeki was elected as its first National Secretary. Like the Rand Youth Club, ASA was Walter Sisulu’s idea, as he was trying to push for generational continuity in the liberation movement. ASA had its stronghold at the Fort Hare University in the Eastern Cape. This was because of the dominant position enjoyed there by the African National Congress Youth League (ANCYL) before it declined after banning of the ANC in April 1960. In 1962, a Pan Africanist Congress (PAC) connected student movement; the African Students Union of South Africa (ASUSA), which became an arch rival to ASA, was established. While these two African student movements had their ideological differences, they viewed themselves as student wings of the national movements (ANC and PAC). 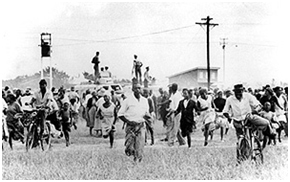 Among other events that inspired the formation of ASA was the Sharpeville massacre which happened on 21 March, 1960. On this day the PAC staged an anti-pass demonstration outside Sharpeville police station near Vereeniging. They left their passes behind and handed themselves over to the police demanding to be arrested. The march ended in tragedy when the police opened fire on the unarmed protestors killing 69 people and injuring close to 200 others in what became known as the Sharpeville Massacre. This event led to the banning of ANC and the PAC in April 1960 under the Unlawful Organisations Act forcing both liberation organisations to go underground. On 16 December, 1961, just a day before the formation of ASA the country was commemorating the 123 years anniversary of the Battle of Blood River of 1838. This historic event took place near the Ncome River in KwaZulu Natal, between the Zulu's and the Voortrekkers. About 10 000-20 000 Zulu warriors led by Dingane's generals Dambuza (Nzobo) and Ndlela kaSompisi attacked the Voortrekkers, but the 470 Voortrekkers, with the advantage of gun powder, warded them off. The ASA almost coincided with the launch of uMkhonto weSizwe (MK), the military wing of the ANC, which announced its existence on 16 December 1961. During the aforementioned day, the military wing performed their first acts of sabotage, with attacks on post offices and other buildings in Johannesburg, Port Elizabeth and Durban. 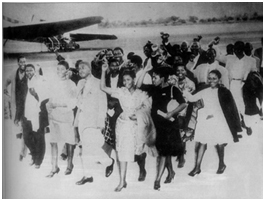 Events in the country at the time forced many of ASA leaders to go to exile in the early 1960s. Once in exile, the ANC elders in London asked Mbeki to launch an organisation of South African students and youth in Britain to continue resistance against apartheid. In 1964 Mbeki, Essop Pahad and others convened a meeting in London to establish the South African Students Association (SASA). SASA in London was to take a different path from ASA in South Africa as it was going to be a non-racial and non-sectarian movement. Yet again, at this meeting Mbeki was elected as secretary, a PAC man was elected chairman and a White student was elected vice-chairman. Shortly after they were elected, Mbeki clashed with his superior in Dar-es-Salam, James Hadebe over SASA’s non-racial policy. Hadebe instructed Mbeki to disband SASA and set up a new organisation. Mbeki declined, suggesting that youth organisations such as SASA can be used by underground ANC structures. In 1965 Mbeki drafted a political document outlining the imperatives of mobilising already-existing youth and student organisations to fight against apartheid. ANC’s Oliver Tambo and ASA students at Dar-es-Salam, Tanzania, November 1962. Courtesy of the Mbeki family. Source: Thabo Mbeki: The dream Deferred. The ANC leadership accepted Mbeki’s argument and in 1966 the ANC Youth and Student Section (ANC YSS) was formed with Mbeki as leader in Britain. The ANC YSS had two main objectives: looking after the welfare of the ANC youth and mobilising youth against apartheid internationally. ANC YSS leaders would later play critical roles in the country’s transition to a democracy. They included Billy Modise, Joe Nhlanhla who would later become Mbeki’s first minister of intelligence and was the chair of the ASA in Moscow, Union of Soviet Socialist Republics (USSR), Jackie Selebi and many others. In Moscow Sipho Makana was elected as the leader of the ANC YSS by the ANC headquarters in Tanzania. Manto Mali (later Tshabalala-Msimang), Vera Gule, Petrus Sibande, Sindiso Mfenyane, Thabo Ragape and Max Sisulu, the son to Walter and Albetina Sisulu, were among ANC students who were in Moscow. There was a general feeling that ASA students were different from MK recruits as they were always isolated, while MK recruits were normally in large groups in camps.